I never particularly cared for hunting. The only good thing I could see about it was it gave me a reason to get out of the house and into the woods. No one expected me to bring any game home, which is good, because I never did. I can remember standing in the backyard of friend's house when I was six or seven years old and watching his older brother fire his BB gun at a blue jay, which happened to fly over. I was sick when the bird, mortally wounded, fell from the sky. My hunting career ended that day. However, I continued to use guns, first Daddy's second-hand twenty-two rifle, and finally a J.C. Higgins, bolt action, 12 gauge shotgun, that I bought when I was a senior in high school, as a reason to tramp through the woods, alone. With the shotgun I could pass myself off as a hunter and hike around the Ocala National Forest with out having to explain that I just enjoyed being in the woods. On a solitary trip to the forest, I happened to run into a couple of my high school classmates. Because I was carrying the shotgun, they assumed I was a hunter, and I didn't tell them otherwise. They never suspected it wasn't loaded. A few days later they asked me to join them on a trip to a lake they believed to be long forgotten. Frank had been told by his grandfather that the isolated lake was always covered with ducks. The old man had even drawn a map for Frank, so he could find this forgotten gold mine of ducks. I agreed to join them for the opportunity to see the lost lake that was covered with ducks. I knew I'd never shoot a duck, and I was reassured by the notion that neither of my friends had the skill required for the task. Frank and Tommy picked me up before sunrise on the first day of our Christmas vacation. We drove twenty miles west, pulled off the state road in the middle of nowhere, consulted the map, then turned onto a road that was little more than two ruts. It was almost overgrown by scrub. We followed the ruts until they disappeared, parked the car, looked at the map and headed north. A couple of freezing miles later, we topped a small rise and ahead saw what we instantly knew to be the mystical lake. If there was a doubt in our minds, it disappeared when we noted there were at least five hundred ducks on the far side, slowly working their way around the edge the of the lake toward our side. Frank whispered, "We have to crawl from here." Tommy, also in a whisper, said, "You're crazy. Look at the mud we will have to crawl through." We were all staring at the mud, then the ducks, when Frank said, "That's the only way we'll get close enough for a shot." They both looked at me and I shrugged, knowing in my gut this wasn't going to work, but not knowing what would keep it from working. I despised the low crawl even before I experienced the Army's version of it. I'm sure it stems from the two hours that Frank, Tommy, and I spent crawling though mud at a painfully slow pace to avoid alarming the ducks who were slowly working their way toward us. Ten yards away from the water, Frank whispered, "That's good. We're close enough. Now all we have to do is wait." Lying on my back, cradling my shotgun, I stared at the sky and wondered how the ducks would get out of this without losing a few of their number. I knew I wouldn't hit one, but I didn't see how Frank and Tommy could miss bringing down at least a couple. Just as I was beginning to question my, up to that moment, infallible knowing, something began crashing through the underbrush on the far side of the lake. Whatever it was, it was heading for the water. I slowly rolled over over on my side and looked toward the sound, just as two boys, maybe eleven or twelve years old, burst out of the underbrush and ran toward the water, shouting, over and over, "Fly ducks, fly." The ducks, almost, but not quite within range of our guns, raised out of the water, looked toward the boys, then in a perfectly orchestrated move, ran three steps on the surface of the lake and lifted off as one. The boys, sank into the mud laughing at the spectacle, as the three of us struggled to get our cold, wet, bodies back in upright positions. I guess we looked looked like apparitions from a Saturday night swamp movie. The boys took one look in our direction and ran howling back into the woods from which they had appeared moments earlier. 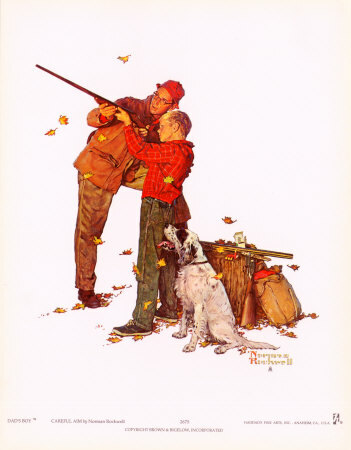 Duck Hunting was number four in my Norman Rockwell inspired series of blogs. 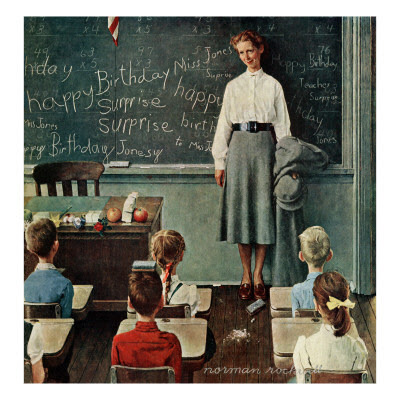 Tomorrow's post will be Miss Tillman (my first grade teacher). Here's the Rockwell painting I'll use to illustrate it. See you then. Marvelous!! I believe in hunting with only a camera. God's creatures are too beautiful, too necessary, to kill. Beautiful story, Bama!! I can always count on you - not something I can say about a whole lot of people. I'm glad you always there by the fire. Wonderful story. So visual it was like watching a motion picture, and I could feel the water soaking into my shoes and the mud squishing between my toes. I was never a hunter, but I did like to go along and watch the dogs hunt and wish I could be as smart and quick as they were. There are many creatures thankful for the fact there one less person is hunting them. Your fingers are best used for creating stories rather than pulling triggers, Bert. Thanks for another wonderful story! Hi there! I just want to offer you a huge thumbs up for the excellent information you’ve got here on this post. I’ll be coming back to your site for more soon.